The Digital Research Library of Illinois History Journal™: French Chicago During the Eighteenth Century. Americans tend to attribute their national heritage to the thirteen British colonies established in the 17th and 18th centuries along the Eastern seaboard, and show little awareness of the simultaneous colonization of North America, especially in the Great Lakes region, by the French. As a consequence, remarkably little has been written about the long, turbulent, and fascinating French phase of Chécagou as a village prior to Jean Baptist Point du Sable's (the "du" of Point du Sable is a misnomer. It is an American corruption of "de" as pronounced in French, "Jean Baptiste Point de Sable" and first appears long after his death) settlement near the mouth of the Chicago River in the 1780s. One reason for this blind spot in historical knowledge is that the people who made this history left very few written records. Most of them were illiterate, and almost everyone's energies in those early days were absorbed by the never-ending task of assuring survival in the primeval and generally hostile wilderness. Initial and lingering discrimination may also be a factor; after all, in the early 1830s Chicago's French population was quickly overwhelmed by the newly arriving English-speaking settlers, and overwhelmed not only in numbers. Considered by many as a "miserable race of men," they were sorely disparaged for the company they kept and were ushered out of town almost as unceremoniously as were their friends the Indians, with whom many of the French had formed close family ties going back several generations. The appearance of the French in North America began in 1534 with Jacques Cartier's exploration of the St. Lawrence River, on a commission from his king, Francis I, who was seeking a northwest passage to China. Cartier did not find what we now know never existed, but on May 3, 1536, in a ceremony near what is now Quebec, he claimed the St. Lawrence River and its entire drainage basin for the French crown. When, however, it was learned that he had found neither the passage to China nor a source of precious stones and metals as had been anticipated, French authorities lost interest in further exploration. It was not until the end of the 16th century that efforts to colonialize North America were revived by King Henry IV of France. From Quebec explorers easily proceeded up the St. Lawrence and then into the Great Lakes. In 1634, exactly 100 years after Cartier's first landing on the Atlantic coast of the continent, the first white man, traveling with seven Huron Indians, entered Lake Michigan by way of the Straits of Mackinac. 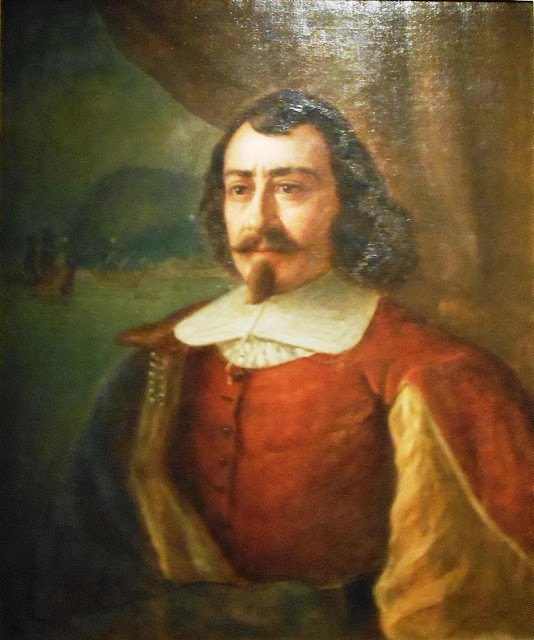 He was French explorer Jean Nicollet, agent for Governor Champlain of New France, who had been sent westward to explore the unknown territory. On the shore of Green Bay, believing that he had reached China, Nicollet dressed in colorful embroidered silk robes before landing. Encountering Winnebago Indians, he soon realized his mistake. In the second half of the 17th century the progress of French colonization accelerated. Missions and forts were established in quick succession along the St. Lawrence and at scattered locations around the Great Lakes. The first mission in the Lake Michigan region was built by the Jesuit Father Claude Jean Allouez in 1669 on Green Bay, and in 1671 was moved to the site of the present town of De Pere, Wisconsin, the name referring to Father Allouez. Soon there was a village of traders, and it became the starting point for southern and westward travel via an important water route: the Fox-Wisconsin portage to the Mississippi River (the Indians called the Mississippi River, "Sinnissippi," meaning "rocky waters"). Marquette and Jolliet, in 1673, are among the better known French explorers who began their journeys there. 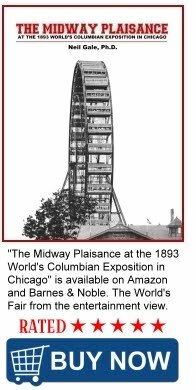 (Thirty years later, when traders had established themselves in Chicago as well, overland traffic between the two settlements was maintained by way of the Green Bay Indian Trail. One of the major trails of early Chicago, it can still be traced in the city street pattern as Clark Street, where it follows a former beach ridge of ancient Lake Chicago. Also in 1671, Father Jacques Marquette founded the Mission de Saint-Ignace on the northern shore of lower Michigan at what is now called Point St. Ignace, where a small village of traders had already formed. For the protection of these missionaries and traders, French soldiers under the command of Louis de Buade, comte de Frontenac, were assigned to the region and built Fort De Buade in 1672, later relocated and named Fort Michilimackinac. One year later in September 1673, Father Marquette and Louis Jolliet canoed down the Chicago River on their return trip from exploring the Mississippi. 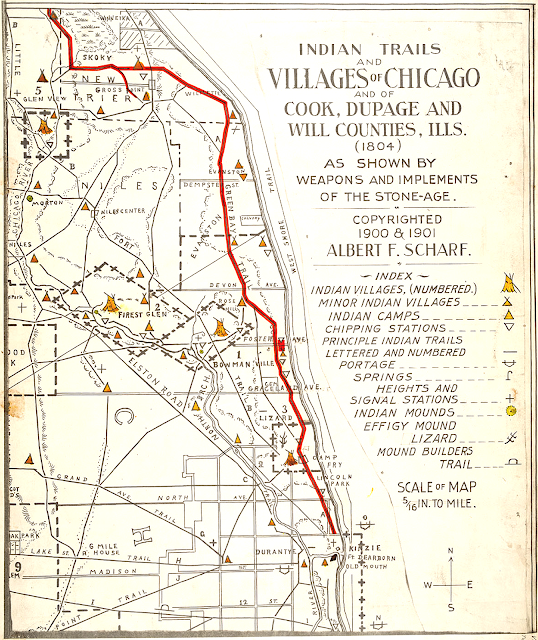 Thus, not only did they discover the Chicago site, but they also recognized the strategic importance of the Chicago portage that linked the Great Lakes with the Mississippi, as documented in Jolliet's report to the French government. During the next 25 years many other missionaries, traders, and military men followed the pathways opened by Marquette and Jolliet, travelling south from their bases at the north end of Lake Michigan and leaving their footprints at Chicago and in the Illinois River valley. The early French exploration of North America and its penetration of the Great Lakes region were, however, but a prelude to the story of the extensive activity and settlement in the area that is now Chicago. As members of the French and Illiniois tribe met and interacted, they saw opportunity in one another. The French had visions of economic development and colonial expansion along the Mississippi. The Illinois sought sophisticated weapons needed to defend their villages from attacks by hostile tribes. With these incentives, a cultural collaboration emerged that would endure for nearly a century. Both societies, Illinois and French, changed during this period of interaction. So did the cultural relationship between them. The collaboration was built on three cornerstones: economy, military, and religion. The Illinois and French became co-dependent trade partners and military allies, while at the same time the French sought to "civilize" the Indians by converting them to Christianity. These interactions spawned changes in other aspects of life, including technology, settlement, marriage, and population size. The effects of collaboration were uneven in the sense that the Indians changed to a greater degree than did the French colonists. However, both societies were affected in important ways. It is difficult to say exactly when the collaboration began. The Illinois and French were cognizant of each another decades before they actually met. Samuel de Champlain, the explorer who has been called the "Father of New France," took baby steps toward the Illinois when he began charting the St. Lawrence River valley and the eastern Great Lakes in the early 1600s. Champlain also initiated the French fur trade. Samuel de Champlain 1567-1635. - The Father of New France. Animal skins, especially beaver, were in great demand in Europe. 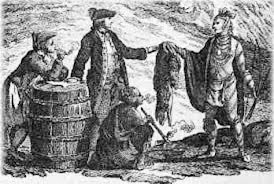 Champlain sent itinerant French fur traders (Coureurs de bois) to travel among the Illinois exchanging French trade goods for pelts. When the beaver populations were depleted in the St. Lawrence trapping grounds, traders sought new suppliers among the Pays d'en haut; upper-country (Pays d'en haut: a territory of New France covering the regions of North America located west of Montreal) tribes of the Great Lakes. exchanging European goods for fur pelts. In 1634 multilingual fur trader Jean Nicollet became the first Euro-American to see Lake Michigan. While visiting a Winnebago Indian village in the Green Bay region, he sought information on undocumented Indians who lived beyond that point to the west and south. Among the groups reported by Nicollet and his successors was a large nation living well south of Green Bay called "Eriniouai," "Liniouek," or "Aliniouek," names signifying the Illinois or Illiniwek Indians. In that same year, fur traders established a new trading post (La Pointe) on the southwestern shore of Lake Superior among refugee villages of Huron and Ottawa Indians. Father Claude Allouez, a Jesuit priest who accompanied the fur traders, founded a mission there called St. Esprit. News of the trading post spread quickly to distant Illinois villages. The Illinois desired access to the French trade, but to get to the new post they would have to travel through hostile Sioux territory. After negotiating peace with the Sioux, the Illinois sent a delegation of eighty merchants on a thirty-day journey north to Lake Superior. It was there, in 1666, that the first known face-to-face meeting occurred between the Illinois and the French. At La Pointe, the Illinois exchanged furs for guns, gunpowder, kettles, hatchets, and knives. They also met Father Allouez, who queried them about their homeland, their history, and their belief system. Allouez noted in his journal that the Illinois used bows and arrows in hunting and warfare but rarely muskets. He added that "these people... used to be a populous nation, divided into ten large Villages; but now they are reduced to two, continual wars with the Nadouessi [Sioux] on one side and the Iroquois on the other having well-nigh exterminated them." The Illinois became regular visitors to La Pointe until a new post, closer to home, was established in 1670 at Green Bay. The desire for firearms and other trade goods was so strong that some Illinois settled near the new post among villages of the Mascouten and Miami tribes. Soon the fur trade came to the Illinois Country. In the 1680s, René-Robert Cavelier, Sieur de La Salle (or: René-Robert de La Salle), and Henri de Tonti undertook an ambitious campaign of exploration and commerce in the Mississippi Valley. La Salle and Tonti descended the Mississippi to its mouth in 1682 and claimed title to Louisiana in the name of King Louis XIV. 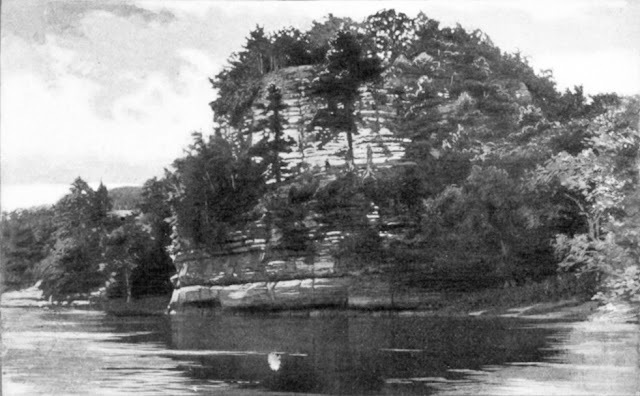 Fort Saint Louis du Rocher (on "the rock") on the Illinois river. After returning to the Illinois Country they built a center of operations, Fort Saint Louis du Rocher [on "the rock"], atop a prominent sandstone cliff in present day Starved Rock State Park overlooking the Illinois River. Then they recruited a huge colony of Indians to supply them with hides and furs. The prime village location, across the river from the fort, was reserved for the Kaskaskia, Peoria, and other Illinois tribes. Four other Algonquian-speaking tribes (Miami, Piankashaw, Wea, and Shawnee) also joined the colony and established villages in the surrounding region. At its peak, the colony comprised an estimated twenty thousand Indians. It disbanded a few years after La Salle's death in 1687. However, Tonti and others maintained forts or trading posts among the Illinois from then on. Once the Illinois gained access to French trade goods, they became middlemen in an extensive trade network. They received hides and furs from the Osage and Missouri tribes, for example, which they passed along to the French for guns and other goods. One "currency" of the trade network was Native American slaves. Illinois warriors often brought home captives when they raided villages of the Pawnee and Quapaw tribes. Some captives were adopted by Indian families to replace family members who had died. Others became the property of whites living in Canada or in the Illinois Country. La Salle, for example, kept several slaves given to him by the Michigamea Illinois. One was a woman who had been captured from the Panneassa (Pawnee) tribe; another was a teenage boy from the Pana (Wichita?) tribe. The military alliance between the Illinois and the French was the second cornerstone of their collaboration. Throughout the historic period the Illinois were surrounded by tribes hostile to them, including the Winnebago to the north and the Sioux to the northwest. Among their most bitter enemies were the five tribes of the Iroquois Confederacy (Cayuga, Mohawk, Oneida, Onondaga, and Seneca). The Iroquois lived southeast of Lake Ontario in what is today central New York. In the 1640s, Iroquois warriors began attacking Great Lakes tribes to capture a greater share of the fur trade. Armed with muskets, they had a clear military advantage. According to Ottawa informants, the first Iroquois attack on the Illinois occurred about 1655. Although the Illinois soundly defeated that war party, they did suffer losses and most took refuge west of the Mississippi River. At the time of Jolliet and Marquette's 1673 voyage, only the Kaskaskia Illinois had returned to the Illinois valley. The Iroquois returned to the Illinois Country in 1680, when they killed or captured more than seven hundred Tamaroa Illinois near the mouth of the Illinois River. La Salle's fur-trade colony, with power in numbers, provided a measure of protection for several years. Fort Saint Louis du Rocher at Starved Rock, Illinois, withstood an Iroquois attack in 1684. A Battle with the Iroquois. Three years later, a force of 279 Illinois, Miami, and Shawnee warriors joined Tonti and the French Canadian army in a victorious raid on four Seneca Iroquois villages south of Lake Ontario. Eight hundred Illinois warriors set out to attack Iroquois hunting parties in 1688 and returned after killing or capturing sixty men. Then, in 1691, the Kaskaskia and Peoria tribes fought off an Iroquois war party near Fort Saint Louis du Rocher. The threat of Iroquois attacks finally subsided at the end of the century, when a peace treaty was concluded between the Iroquois, the French, and their Native American allies. Representatives of six Illinois tribes traveled to Montreal to sign the treaty in 1701. However, new enemies emerged in the 1700s as the population and territory of the Illinois began to shrink. A coalition of tribes, Sauk, Fox, Kickapoo, Powatatomi, and Sioux, attacked them from the north. Meanwhile, Chickasaw, Shawnee, and Quapaw warriors applied pressure from the south. The Illinois were also drawn into military struggles between France and Great Britain in the Ohio Valley. These conflicts erupted in the French and Indian War (1754-1760), in which French and British armies fought one another with the assistance of Native American warriors. The Illinois were faithful allies of the French in these battles, while other tribes sided with the British. For example, three hundred Illinois joined the French army that defeated George Washington at Fort Necessity in 1754. In subsequent years Illinois war parties raided English troops and settlers in Pennsylvania, Virginia, Georgia, and the Carolinas. Despite the efforts of the Illinois warriors, Great Britain ultimately won the war and in 1763 seized control of lands east of the Mississippi River. Religion was the third cornerstone of the Illinois-French collaboration. Traditionally, the Illinois worshiped one god, Kitchesmanetoa (kitch•es•man•e•TO•a) above all others. This belief in a supreme deity attracted the attention of Father Allouez and other Catholic missionaries. In the singularity of Kitchesmanetoa the priests saw a parallel between their own religious beliefs and those of the Illinois, and they hoped that this similarity would make the Illinois receptive to Christianity. The principal motivation of the priests was to save souls. Another was to pacify the Indians and thereby minimize the hazards of French colonization. Jesuit Sermon with the French and Indians. Father Jacques Marquette, a Jesuit priest, founded the first mission to the Illinois (Mission of the Immaculate Conception) at a Kaskaskia Illinois village in 1675. Additional missions, one of which was affiliated with the Seminary of Foreign Missions of Quebec, were established among the Peoria, Cahokia, and other tribes as the French colony grew. Some missions were more successful than others at attracting converts. 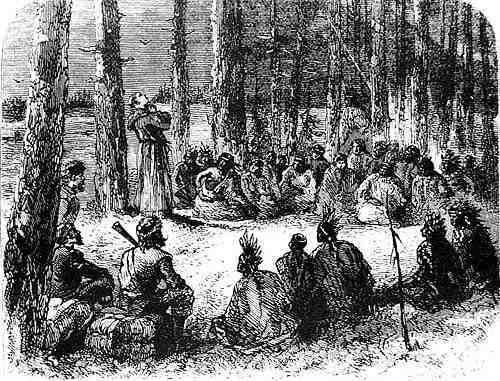 In 1707 Father Jacques Gravier reported that all but about forty of the 2,200 Indian inhabitants of the Kaskaskia village "profess the catholic faith with the greatest piety and constancy." Members of the Peoria tribe, however, often resisted the new faith and held to the traditions of their grandfathers. Despite these differences, the missions became an important communication link between French and Illinois societies. The cultural collaboration between the Illinois and their French neighbors changed aspects of life in both societies. Some changes were thought to be beneficial and were actively pursued -- at times with mixed results. Others, unforseen and unforeseeable, had devastating consequences. The Jesuits established the "La Mission de L'Ange Gardien" [the Guardian Angel Mission] was founded in 1696 by Father Pierre François Pinet on the Chicago River. Here he served with Father Julian Bineteau, and later with Father Jean Mermet. A contemporary account by Father J. F. Buisson de St. Cosme, a Seminarian missionary (member of the Seminary of Foreign Missions) from Quebec, locates it on the north bank of the Chicago River between Michigan and Rush, a “dry” area. This was a logical location for a mission: solid ground, easy access to the lake, the river, and the portage, great numbers of passing Indians and Indian villages nearby. Father Buisson St. Cosme, supplied a vivid picture of the mission in his report, also indicating that French traders lived nearby. This comes as no surprise; missions and trading posts were usually found in close proximity to one another. Indians were attracted to the posts for the merchandise they offered, thus giving the missionaries opportunities to convert them. Father Buisson de St. Cosme counted about 250 Miami Indian cabins in the vicinity. The Mission flourished until 1702 or 1703 until infighting between Seminarian missionaries from Quebec and the Jesuits caused the end of the mission. In 1699, it was visited by three priests from the Society of the Foreign Missions of Quebec, conducted to Chicago by Henri de Tonti, the friend and faithful lieutenant of the great explorer René-Robert Cavelier de La Salle, already dead by that time. The same year, the royal governor, Count Frontenac, mediated an agreement. The Jesuits gave up their mission at Chicago but kept their huge mission at the Kaskaskia Indian Reservation, just west of Murphysboro, Illinois. The Seminarians got the Mississippi Valley. The Kaskaskia were, however, moving to the banks of the Mississippi on the Illinois side, some 65 miles south of the future St. Louis. The Jesuits had little choice but to follow. Chicago was left without any missions. The La Mission de L'Ange Gardien's short existence left no visible traces. Changes in technology, particularly among the Illinois, are evident in historical documents as well as in archaeological excavations at Illinois village sites. Traditional Illinois technology was well suited to an independent existence because it was based on resources that could be obtained in their natural environment. The situation changed when European trade goods were made available to them at French trading posts. Guns and gunpowder appeared to be, and perhaps were, critical to their survival. On the other hand, acceptance of firearms may have thrust the Illinois into some conflicts that were more beneficial to the French than to themselves. Other trade goods had minimal survival value, but were adopted by the Illinois because they offered a perceived advantage over traditional objects. Brass kettles, for example, probably became desirable trade items because they were more durable and easier to carry than fragile earthen pots. Also, kettles had value even after they wore out and could no longer be used as containers. The Illinois cut up old kettles to make brass arrowheads, tinkling cones, and beads. Settlement locations were also affected by inter-cultural collaboration. In the late 1600s and early 1700s French forts, missions, and villages were invariably established at or near large Illinois summer villages. Clustered settlement offered mutual protection and also maximized social interaction between the two societies. New settlement locations were chosen by mutual consent after considering such factors as defense and resource abundance. For example, in 1691 the French commander of Fort Saint Louis du Rocher met with chiefs of the nearby Illinois village to consider moving. Both parties were concerned about the vulnerability of their settlements to Iroquois attack. Another problem, voiced by the Illinois, was that firewood was no longer available near their village. All agreed to relocate the entire complex downstream at Lake Pimitoui (present Peoria), where there was an abundance of game and other resources. Clustered settlement had a predictable, but controversial, effect on marriage patterns. Many of the French habitants (settlers) who occupied multiethnic villages along the Mississippi River in the early 1700s were former coureurs de bois who wished to settle down and raise families. However, few French women of marriageable age lived in their villages. Even when French women were available, the habitants often turned their affections to Illinois women, and inter-ethnic marriages became common. Archives of the Kaskaskia parish indicate that of twenty-one infants baptized between 1701 and 1713, twenty were born to French fathers and eighteen were born to Indian mothers. Although mixed marriages were banned in 1735, they created the nucleus from which the French colony grew. One tragic outcome of cultural collaboration in the Illinois Country was the spread of epidemic diseases. Various European diseases, unwittingly introduced by the French, caused numerous deaths among the Illinois Indians. Many children became ill and died in the winter of 1692-1693 from a disease that has not been identified. This was followed by a smallpox epidemic in 1704, a possible measles outbreak in 1714 that killed two hundred Kaskaskia Illinois, and additional smallpox epidemics in 1732 and 1756. Together, disease and warfare caused a massive population decline. Nearly eighty percent of the Illinois population evaporated between the time of European contact and the end of the French colonial era in 1763. Meanwhile, the French colony grew slowly and steadily but evidently never attained a total population of more than two thousand people. Cultural changes brought on by social interaction had lasting effects on the Illinois Indians as well as their French colonial neighbors. The Illinois became increasingly dependent on the French with every fur they traded and every cultural tradition they abandoned. The road to dependency was also hastened by losses of population, territory, and political power. For their part, French activities in the Illinois Country relied on the Illinois -- some-times heavily -- for economic and military support. The practical benefits of cultural collaboration may have decreased for the French as the size and power of the Illinois population shrank. Nevertheless, the Illinois Indians left an indelible mark on the French and their colonial history in Illinois. By the year 1700, both a mission and a trading post stood on land that is now almost at the center of the City of Chicago. And with the year 1701 begins the story of French Chicago During the Eighteenth Century. The Chicago traders of that time, referred to by Father Buisson de St. Cosme only in passing, are well known from other sources. The trading license was held jointly by Sieur Pierre de Liette, in charge of managing the post, and François Daupin de La Forêt. Both were men of noble birth. De Liette was a relative of Tonti, who was also a partner in the trading enterprise, and who visited and helped as often as he could. A fourth partner was Michael Accault, married to an Illinois Indian since 1695, and well known as a former traveling companion of the exploring French priest and author Father Hennepin. In addition to these rather illustrious and educated men were living nearby, with their Indian wives, various associated traders and helpers, members of the working class, needed to perform the more menial tasks; the names of some are recorded in old notarial records in Quebec. The post was in existence from approximately 1696 to 1702, roughly concurrent with the Guardian Angel Mission. It is not known whether the traders or the missionaries arrived first. After thriving for a few years, the post suffered the same fate as did the nearby mission: it had to be closed because raiding Indian tribes made life in the area too dangerous - at least for a while. Indian attacks became the dominant problem for early French pioneers in Illinois, a problem that remained pathognomonic during most of the century that had just begun. 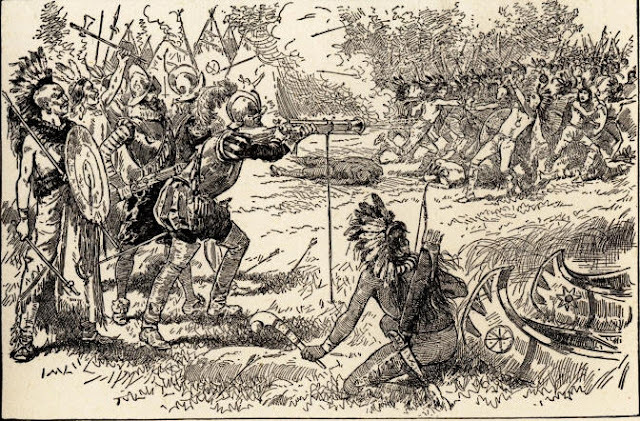 A war between the French and the Fox Indians started about 1700, and lasted for 40 years. An Algonkian language tribe originally near the western end of Lake Erie, the Fox were driven westward in the middle of the 17th century by the Huron-Iroquois wars. Initially friendly trading partners of the French, who referred to them as Renards, they allied with the Iroquois and turned against the French, severely restricting first the Wisconsin-Fox River portage and, around 1700, the Chicago portage. Their actions disrupted community development in the Illinois River valley, along the Mississippi, and in Chicago. For political reasons the seat of French regional government at Michilimackinac, and with it the protective military presence which during the two previous decades had at times extended as far as Chicago and St. Joseph, was transferred to the new Fort Pontchartrain du Détroit (the founding of Detroit, Michigan), built in 1701 by Antoine de La Mothe Cadillac. Soon thereafter Indian raids began. Any French traders who held out in isolated Chicago during those most difficult years had to lay low. In 1711 Joseph Kellog, of English background but a member of a Canadian trading party, traveled with his group by boat from Michilimackinac to the Mississippi River by way of the Chicago portage. In his diary he described the multiple villages he encountered on the trip, but said nothing about Europeans in Chicago, although he reports on the land, vegetation, and game of the locale. Most likely the villagers had temporarily abandoned the place in favor of safer settlements such as Detroit, Cahokia, or Kaskaskia. On his 1718 map, which he called Carte de la Louisiane et du Cours du Mississippi, the French cartographer Guillaume Delisle has printed the name "Chicagou" in its proper place along Lake Michigan, and he shows a settlement on the west bank of the north branch of the Chicago River near the forks, approximately the location where later in the century a trader by the name of Guillory - to whom this story will soon return - had his post. Delisle was a careful, reliable man working for the French crown. He probably used 1717 information to make this map. Nobody knows who owned this post. Perhaps it was an earlier member of the Guillory family of Michilimackinac. If the post was held by the same family for several decades, it would more plausibly explain why the north branch around 1823 became known as Gary River (phonetic spelling of Guillory's River). Not all of the French folks calling Chicago their home during the 18th century lived in what we now refer to as the downtown area. All, however, lived along waterways, usually the Chicago portage, also called Portage des Chênes. Overland travel with trade goods, because it was difficult and more hazardous, was uncommon, except if one was forced to portage. It is maintained by some historians, that an oak forest at the southwestern end of the Chicago portage harbored a French village from about 1740 on. It was called the "Point of Oaks" and is adjacent to today's Chicago Portage National Historic Site at Harlem Avenue and 48th Street. 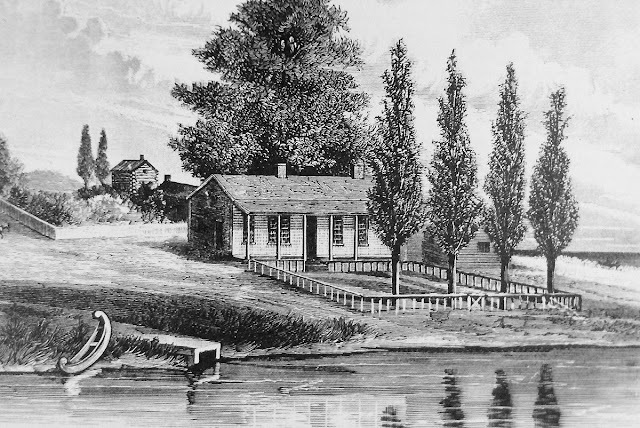 It is believed that here lived the trader Jean Baptiste Amiot with his Ottawa wife Marianne, and that their son Louis was born here, although it is possible that their cabin stood further downstream on the Des Plaines River. The Amiots were a large French family with members in various parts of Canada. Louis's grandfather, Sieur Charles Joseph Amiot, owned a house within the Fort Michilimackinac settlement, as shown on a contemporary map of 1749. We know about Louis and his parents from his baptismal record of June 14, 1746, at Michilimackinac, which reads as follows: "...the said child having been born at the Rivière aux plains near chikago at the beginning of the month of October last." Michilimackinac was the church home for most of the early French Catholic traders in the Chicago region, as it was for the family of Jean Baptiste Amiot. For the greater part of the 18th century no priests lived near Chicago, and contact with the clergy could be maintained only intermittently by traveling long distances. But maintained it was, as historians acknowledge with gratitude, because in an age of general illiteracy only the missionaries could be counted upon to create a measure of written vital statistics. Of the next known Chicago settlers we have a somewhat mythical report from Governor John Reynolds of Illinois, who during his retirement wrote much about the pioneer history of the state. Reynolds tells of a remarkable woman, born in St. Joseph in 1734 as Marie Joseph Larche. According to Reynolds she lived to the ripe old age of 109, leaving behind four husbands in succession, and it was with her first husband, as Mme Marie Sainte Ange, that she moved from Mackinaw to Chicago in 1765, where they resided for fifteen years. It should be stressed however, that Governor Reynolds' recollections on this subject are in need of independent confirmation. They were, according to his own words, written largely from memory and are in conflict with documents created during Marie's lifetime. In 1763 the French and Indian war ended. It represented the American phase of a worldwide nine year long struggle for supremacy in North America and elsewhere between France and England, and it was won decisively by England. In the same year the Treaty of Paris was signed, and Chicago became officially British. But it was already de facto British when, in 1761, the British Lt. Dietrich Brehm visited and mapped the "Chicago" village during his survey of the newly-won territory. He found several settlers there. They were still present in 1763. In the writings of a later Chicago pioneer, Gurdon Saltonstall Hubbard (1802-1886), there can be found testimony to an early Chicago trader by the name Guillory. As a young man Hubbard hired on with John Jacob Astor's American Fur Company, first came to Chicago in 1818, and in his later years relates that early on he was shown by several of Astor's veteran traders the outlines of Guillory's former farmstead and trading post, and he was told that it existed prior to 1778. Located strategically on the west bank of the north branch of the Chicago River near the Forks, where Fulton Street now crosses, it allowed for surveillance of all three parts of the waterway. No one knows when it was first established, nor when exactly it was abandoned, but it is likely to have been there for a long time, because, as indicated above, it gave its name to the north branch, "Guillory's River," a name that was used as late as the 1830s. The name Guillory is often found written in modified versions, such as Guilleroi, Garie, Gary, or Guarie. The historian Milo Quaife believes that Guillory's first name was Jean Baptiste. According to Swenson he was of the family of Simon Guillory who died at Mackinac in 1744, and the trading post, while owned by the family, was often run by hired help. We can only speculate as to what doomed the post in the end. Certainly, trade could not thrive in times of warfare, and the American Revolutionary War began in 1775. In May 1770 Jean Orillat, trader, merchant, land owner, and the wealthiest man in Montreal, financed the travel of two canoes licensed to go to Chicagou under the direction of Jean Baptiste St. Cyr with eight other engagés (a Canadian word from the time of the fur trade, meaning contract laborer). From surviving records we know their names and the merchandise they carried. Interestingly, they took no trade goods, but only their own provision, plus the surprising amount of 200 pounds of chocolate. This is the only license issued in more than a century in which Chicago is the specified destination. Presumably, it was a scouting expedition to size up the current Chicago potential for a new trading post and to gain the local inhabitants's support for such a venture. Perhaps St. Cyr took up residence here, because his name does not appear on any subsequent list of engagés. But by 1778 Chicago was deserted. Records show that Col. George Morgan, Indian agent appointed by the Continental Congress, and a former prominent trader in Kaskaskia, issued safe-conduct passes in 1776 to "the French people in Chicago" to visit Pittsburgh. The names of these Chicago settlers are not recorded. We know, however, that in 1778 and 1779 Pierre Durand, a Cahokia trader, passed through Chicago en route to Point du Sable's early trading post at Rivière du Chemin and encountered only Indians. The historian Clarence W. Alvord found records indicating that in 1782 Jean Baptiste Gaffé of Cahokia sent boatloads of trade goods to Chicago. From this we infer that he had a post there. Over what period of time he maintained this post, we do not know. It could not have been earlier than 1780. Among the preserved papers of the British General Haldimand there is a letter by Philippe François de Rocheblave, deposed last British governor of the Illinois country, who had been taken prisoner by George Rogers Clark at Kaskaskia in 1779, and transported to Virgina, while his wife and children remained behind. He wrote to General Haldimand on Nov. 6, 1783, that he would have to travel from Quebec into the Illinois Country and "find Mrs. Rocheblave and the rest of the family at Chicagou." It is not known at whose cabin the Rocheblave family had found refuge at Chicago; She could have been at Gaffé's post. Jean Baptiste Point du Sable is the best known of the early Chicago traders, and a man of many talents. He earned the respect of his contemporaries, and for those who followed he became a legend, not all of which can be born out by historical research. Legends, however, have their own life, their inherent beauty, and their justification as poetic expressions of the soul's yearning. Point du Sable first appears in the records of Quebec province in 1768. From recent research by John Swenson, we know that he spent most of his early years traveling as an engagé for established Montreal traders in the northwestern Great Lakes region. In 1775 he teamed up with the experienced trader Pierre Durand, and both of them left Montreal for Cahokia in the Illinois country. By 1778 Point du Sable operated a trading post at Rivière du Chemin [Indiana], where the British Major De Peyster's men arrested him in 1779, assuming he had French or American leanings and connections. Later the major came to know Point du Sable personally and changed his mind about him, attesting to his loyalty toward the British crown by introducing him to Patrick Sinclair, British lieutenant governor of the Province of Quebec and successor to De Peyster as commandant at Michilimackinac. Sinclair's estate near Detroit, the Pinery, was subsequently managed by Point du Sable until 1784, when it had to be sold. Once Point du Sable became his own man again, he made his home in Chicago, where the Tribune Tower now stands. 1827 Illustration of the house built at the mouth of the Chicago River by Jean Baptiste Point du Sable. Claimed to be the first house build in Chicago. His Indian wife Catherine came with him. It must have been between 1784 and 1788, and not in 1779, as earlier historians had concluded. For the first few years there were only the Indians for him to share Chicago with. In Oct. 1788, he and Catherine traveled to her church home in Cahokia and had their marriage of long standing solemnized. They had two children, Jean Baptiste fils [Jr.], and Suzanne, and in Chicago in 1796, they enjoyed the birth of their granddaughter Eulalie Marie Pelletier, child of Suzanne and Jean Baptiste Pelletier. Point du Sable was a skilled farmer, maintained good relationships with his Indian neighbors, spoke French, English, and Indian languages, and he stayed until the year 1800. By then his farm had become a valuable estate that he could sell to his neighbor Jean Baptiste La Lime for 6,000 French livres [$1,200], a large amount at the time. While the bill of sale has been preserved and shows La Lime as the purchaser, it turns out that the trader William Burnett guaranteed the payment and was the real new owner. Burnett, of Scottish origin, had his main post at the mouth of the St. Joseph river, but had also maintained a trading post in Chicago since at least 1798. In 1800, Point du Sable moved to St. Charles in present Missouri, and we will not follow him there in this account. Point du Sable left behind a small village of traders, where French and Indian languages were spoken and often mixed. There was Antoine Ouilmette, who says in recorded interviews late in his life, that he became Point du Sable's neighbor in 1790 (the northern Chicago suburb Wilmette is now named after him). In 1792 they were joined by La Lime. Like Point du Sable, both men had Indian wives. Three years after Point du Sable's departure, the English-speaking element was added when Fort Dearborn was built and the trader, John Kinzie, came with his family in 1804 and bought Point du Sable's old house and farm buildings from La Lime. The village grew slowly for the next three decades, maintaining its French cultural dominance until 1833, when an unprecedented population explosion began, so radically changing the face and fabric of Chicago that it was soon no longer recognizable by its original inhabitants.